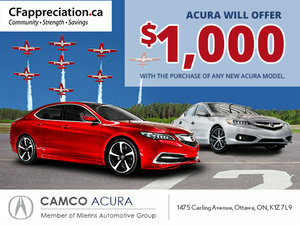 Camco Acura offers a wide range of financing and leasing solutions on all new or pre-owned vehicles. Financing your new or certified pre-owned vehicle should be simple and enjoyable. It is the last step before you drive off in your brand-new car or SUV, and at Camco Acura, we want to make the process as quick and pleasant as possible. Our team of expert financial services consultants will take the time to listen to your needs and understand your budget before proposing a range of financial solutions tailored to you. They will also take the time to explain every option so that you can make an informed decision. Acura offers its clients numerous financing and leasing options that are both flexible and affordable. From low interest rates to advantageous leasing terms, owning an Acura is more affordable than you think. Camco Acura also offers a wide range of protection plans and insurance options that will be thoroughly explained to you so that you can decide if they are right for your needs and lifestyle. To make things easier for you, we also offer the possibility of starting your financing application online. To learn more about Camco Acura’s financing and leasing solutions, contact us today at 1 855 296-2930.